1. Have you guys finished painting your new houses? What paint colors did you choose? How many different colors did you use throughout your house? What colors did you use in which rooms? Brooke: Yes, we’re done painting! In our bedroom, guest room, and entry we used BM Cloud Cover (a creamy white, probably my favorite of all time), in our family room we have BM Balboa Mist, office is BM Decorator’s White (a super bright/crisp white), in the girls’ room I’d have to check I don’t know the name, but it was a super light pink, and everywhere else is wallpapered. Meggan: Everything is painted except my office. We’re actually going to turn our dining room into an office and use the current office as a toy room since the new baby will be taking the current toy room. We probably won’t start that project till the end of summer though. Anyway! I did BM Hale Navy in the laundry room, BM Black Beauty in powder bath, SW Repose Grey 50% in the main rooms and bedrooms, BM Classic Grey in the master bedroom, and BM Cloud Cover in the master bath (thanks to Brooke’s suggestion!). 2. Do you guys have a favorite pair of white denim?? I can’t seem to find a pair that’s affordable, comfortable, not distressed, high waisted and not see through. Is that a lot to ask? Meggan: My favorites are these Hudsons which don’t meet your criteria but this pair (I would def buy these if I weren’t preggo!) and this pair look super cute! Brooke: I don’t have any that I like at the moment (I’m on the hunt!). I like the Hudson pair Meggan has, and I also saw these in Madewell yesterday, they looked great but I didn’t have time to try them on! 3. How do you both handle the hardships that come with marriage? Specifically, what tips do you have to keep the love strong and not let the little fights take over? It’s definitely challenging sometimes! Meggan: Luckily, Kyle and I are pretty easy going and don’t get in a lot of arguments – nothing serious at least. We’ve only been married a year though 😉 But I think communication is key when it comes to the little fights/annoyances. It only gets worse when you bottle things up and don’t communicate them properly. If we get in an argument we always ask “are we going to be mad about this in a year?!”. It’s kind of our joke/what we say to each other when we know we’re bickering about something dumb. We keep the love strong by going on dates, cooking dinner together, and just doing little favors for each other! Brooke: We’re 7 years in, and feel like we finally have this down – it takes time! Marriage is definitely something that takes effort and work – but not in a bad way. We are big on communicating – without communication, your relationship can go downhill quickly. Figure out what works best for you and your hubby – do you need to sit down once a week to talk about things to be proactive? Or are you more easy going, and can take things as they come? Once you figure out what works and both of you are on the same page, it will be so helpful! We have disagreements like every couple, but we never get in full-blown “fights” because we never let it get to that point. If there’s something that is bothering either of us, we sit down and talk about it. We keep our love strong by putting in effort (I call this “pretend like you’re dating”), having regular date nights, and going on double dates with other couples – for some reason that is alway so fun for us, not sure if everyone feels the same? 4. I love the button through dress look! I’ve been trying to find a good one with short sleeves. Have you seen any? This one is so cute, also love this one. A few more (but no sleeves) – this dress, this one, this one, and this one. 5. My city apartment is too small for a standard rectangle dining room table. Any suggestions on a round top table or high top table that’s seats 4? We both had the IKEA tulip table in our apartment when we lived in the city and loved it! A couple other options we’re loving are this one, this one, and this one! 5. Do y’all ever do meet and greets when you’re together? We have never done a meet & greet – we feel like nobody would show up lol! 6. I’m trying to migrate from buying a lot of lower quality items to investing a little more in staples and items I plan to keep for long-term wear/use. I am doing this both to minimize the amount of “disposable” type clothing like t-shirts from target that only get 1-3 wears and feel wasteful but also to declutter and simplify my wardrobe a bit. I am NOT a minimalist, but I think getting a little closer would make my life easier/happier! That said, I’m curious if you have a favorite reseller for any clothing that you get rid of that may be like-new or very gently used. 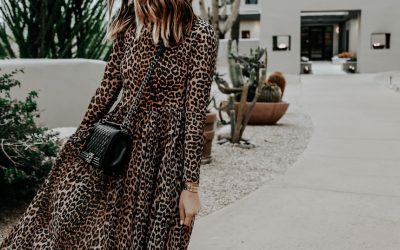 I’ve tried ThredUp in the past but haven’t had much luck with them lately and I have friends that have had more success with Poshmark but understand that it’s a bit more work for the seller. Open to any you may have had luck using in the past. We’ve used Poshmark and we made an IG account to sell clothes which has been successful! 7. Favorite flip flops/sandals for the summer? Meggan: My go-to pairs are these, these, and these! Brooke: My most-worn pairs are these slides, these flip flops, and these! 8. I’m going to a wedding in Boston this September where the dress code is cocktail. Any ideas for a pretty dress in the $75 or less range? Really loving this black dress, this off-the-shoulder dress is pretty, and obsessed with this lace midi dress. Love this one too – it’s classic! 9. Where have you guys bought wallpaper from? Meggan: I haven’t bought any real wallpaper, just the self adhesive kind! Real wallpaper seems like a big commitment lol. But I’ve bought from Chasing Paper and this Etsy shop. Brooke: I’m kind of obsessed with wallpaper, but Meggan is right – it’s a commitment, so I try to stick with neutral(ish) papers I won’t get sick of. If you’re not ready to commit, the peel and stick is amazing! I had this paper and this paper in my old house and loved both! In our new house we have a grasscloth (similar to this), this paper for the play room (which has actually now turned into Avery’s bedroom lol), and this paper in a small hallway. 10. We are heading to Mexico to visit family and I need advice on places for summer clothes. Where would you ladies suggest? I’m looking for shorts, comfy dresses, tees, anything light weight. I’m rollin’ on a college girl budget, so nothing over $30 a piece please. Love this dress, this romper, this hat, these linen shorts, this coverup, this maxi dress, these slides, these denim shorts, this casual tank dress, and this tote! 11. I’m going to NYC for my 30th birthday at the beginning of June with a group of girlfriends. Any recommendations of must dos? Check out question 15 from this post. Also – Catch’s rooftop is now open (that’s on the list, but their rooftop is so pretty!). Also – the rooftop at the Standard Hotel has amazing views, definitely check that out! Walk the High Line, definitely go to Central Park (have a glass of wine at the boathouse if it’s not crowded). I’ve heard the Press Lounge is amazing too, but I’ve never been. This pair is soo cute – love the wide leg! This pair, this pair, and this pair are good too! 13. My husband, 5 mo old son and I are taking family photos in Chicago in two weeks and would love your input on outfit ideas for all of us? It’s going to be more of a casual, lifestyle type shoot in our house and nearby park. We like the look of more casual outfits for these types of shoots, and not too matchy-matchy. Some inspo we love here, here, and one in pajamas in your home would be sooo cute like this! 14. Can you guys PLEASE include sizing in everything you talk about? Lol, I hope I’m not alone in this request…but sometimes I want to buy something you post, then I’m not sure what size to order…so I wait, then it’s sold out! It would be so helpful if you could just include it the first time you show something. Thank you! 15. Just curious how do you guys decide who posts when on the blog/social media? We have an editorial calendar with important dates on it, and we work around that. For blog posts, we switch off every other day or a combined post if we’re both working on something. For social media, we don’t follow a schedule, we just post when we have something to put up! 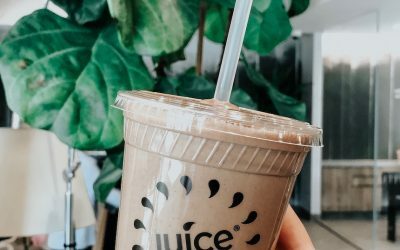 We’re pretty easy-going with the schedule because we feel like if we tried to set guidelines (Brooke posts Mon & Wed, Meggan on Tues & Thurs), it might start to feel forced and not fun/natural. It sounds like you probably only need one business professional outfit (suit), and you can mix and match the jacket and skirt/pants when you need to. We would recommend these pants, this skirt and this blazer. You could pair the jacket with different pants or jeans, and the skirt with different blouses as well. Love this skirt, this one, this blouse, this one (I have, it’s so cute), these loafers and these slides. 17. How do you both keep your nails healthy when you get gel manicures? Mine get so brittle every time I get one! Meggan: I honestly don’t have any tips or tricks. I’ve been getting gel manicures for 4+ years and my nails are fine!! And I even peel mine off which I know you’re not supposed to do. But I read that putting vitamin E oil on them helps keep them strong so you could try that! Brooke: Same. I know gel polish affects people’s nails differently, but mine stay pretty strong and healthy. If I feel like they’re getting thin, I will take a month off, and just use a strengthening polish for those 30 days before going back to gel. 18. I’m 2 months PP and I’m attending a wedding in SOCAL at the end of the month. My husband is wearing a navy/black suit jacket that is going to make a statement. Any suggestions for a dress/jumpsuit preferably under $100 that won’t make me feel like a bore next to him? 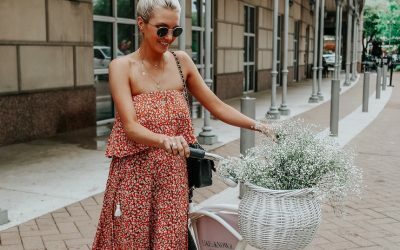 This jumpsuit is gorg, this dress is simple but would look great with statement earrings, love this one, and this floral one too! 19. Congrats on your pregnancy, Meggan! I am 22 weeks with my first. I’d love some spring/summer maternity clothing inspo! Thank you! 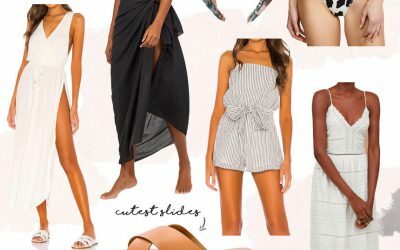 I was actually just looking at Pinterest for some inspo because it’s sooo hot in Texas and getting dressed is honestly awful right now lol! It’s wayyy to hot to wear pants or even shorts. But I like casual looks like this, this, and this. I just plan on buying a lot of dresses (like this and this) and dressing them up with different sandals, sneakers, hats, etc. 20. What books are you currently reading? We have the same taste in books and I always love your suggestions! Brooke: I’m reading It Ends With Us! Can’t wait to get further in b/c everyone says it’s so good, I’m only on chapter 2. Meggan: I’m reading Hopeless. I was hesitant to get it because it’s about a high school couple but it’s Colleen Hoover’s top rated book on Good Reads (love her books) so I got it. So far so good! Late coffee talk question! I’m going to the Taylor swift concert in Chicago. It’s at soldier field and I’m guessing it’s going to be chilly at night. What would you wear? My boyfriend is looking for good pair of casual, but somewhat dressy shoes for the summer. I know your guys have good style, so was wondering if you had any suggestions? Preferably no boat shoes or sneakers. I have a bridal shower in New York in July for my sister-in-law and need some recommendations on what to wear! Is it way too late to get a question in?? I’d love some recommendations for cute sweatsuits. I work from home and cannot stand to lounge around in jeans – but also don’t want to stay in my pajamas all day. (Actually I’d love to, but I know my neighbors judge me.) I’ve seen you guys in some cute loungewear matching sets on insta stories. What are your favorites? Hello! Love your blog! Always buying your recommendations! I’m looking for a denim dress.. midi length.. any suggestions please? I made the cauliflower fried rice and loved it! Can you share some more easy and healthy food ideas? Brooke, I noticed you got the new iPhone X. Do you think its worth it? Not sure if I should splurge for it or not! I’m headed to London for a week with friends at the end of May/beginning of June. I don’t want to pack a lot but I want to have cute/functional outfits- any suggestions? You guys have been rocking such cute but subtle nail designs. Would you do a roundup of other cute nail designs? I’m due for some creativity in my life! Hey Meggan- you went to high school with my brother! I’ve been searching for a leather backpack purse to do double duty as a diaper bag, and can’t find anything I love. Hoping to spend under $100- any suggestions? 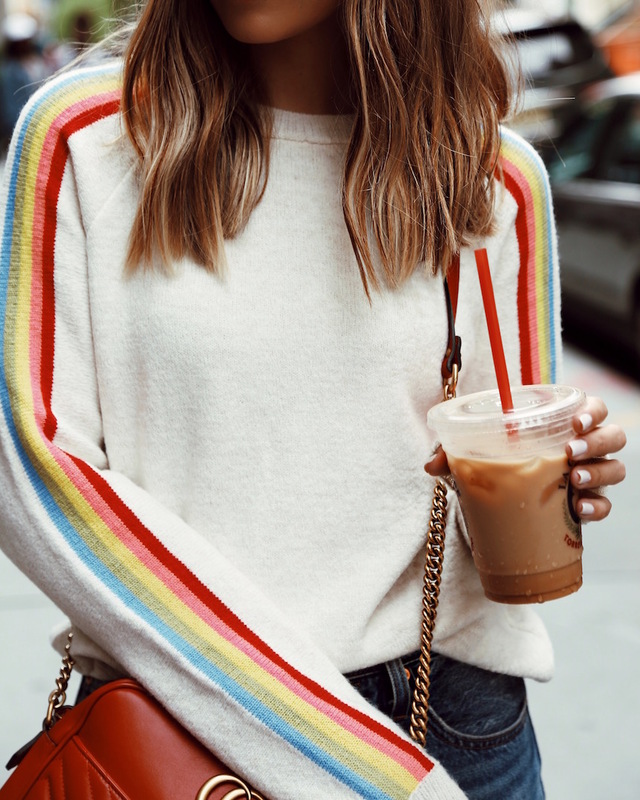 Where is this sweater with rainbow stripe from? Hi! What are some items you’ve been buying for your little ones for spring/summer? I’m looking for summer sweatshirts/pullovers. Suggestions?